Porch foundation cracking or other foundation issues can be an indication your porch needs repairs in order to maintain not only its longevity but safety as well. 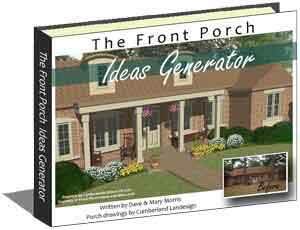 A sagging front porch roof, columns, or even flooring can be indications of porch foundations cracking or shifting. 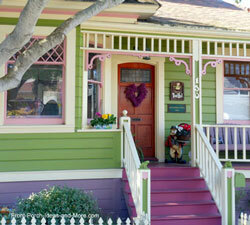 The diagnosis of the actual issue varies based on the type of porch foundation you have. Wood structures are more susceptible to water and rot whereas concrete is more prone to sinking or displacement due to other factors. 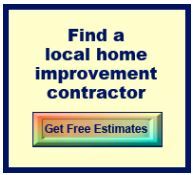 Diagnose your foundation first and then select the right porch repair option (see link below). 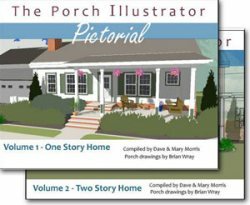 We address porch foundation building considerations and foundation types on our porch foundations page which Mary and I believe you will find most useful. Here, we will cover the basic reasons for foundation cracks and failures and then offer repair options to correct the problem for the various type of foundations. Most of this information may also apply to almost any foundation or structure, not just porches. Let's be clear - everything moves. So that helps explain porch foundations cracking. Your furniture, home, yard, sheds, patios, decks, and yes, even porches move. If constructed correctly, foundations are built to handle movement. The goal is to ensure everything moves together thereby minimizing issues. More likely than not, a porch foundation failure usually means only a portion of the porch moved, thereby creating stress on the part that did not. You won't be able to resolve your foundation issue entirely unless you fix what caused the problem in the first place! In order to repair a cracked foundation or rectify other issues you really need to identify what caused the issue. Is it just a little settling or do you have a more serious issue, that if caught early,will reduce your repair costs? Just cosmetically caulking or repairing the crack may not be sufficient. It may look good, but it won't last long. 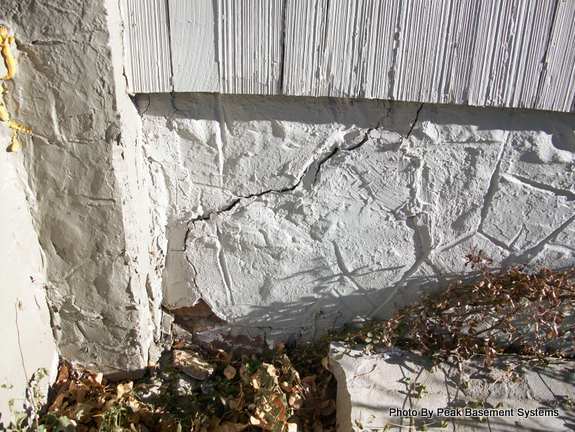 Many porch foundation cracking issues are the result of your soil or conditions affecting your soil. Not all soils are the same and range from rock or heavy clay to sand. 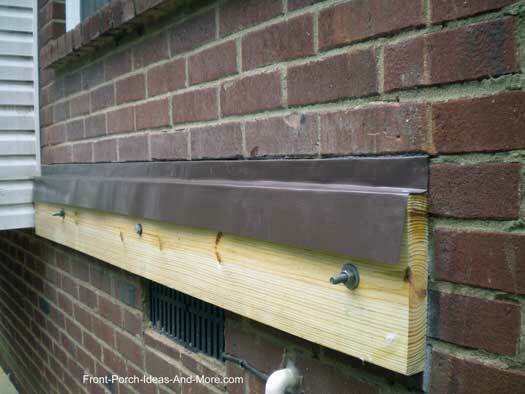 Knowing what your porch foundation is resting on is critical to its repair. Your specific climate impacts your soil. In very hot weather, water evaporates and your soil contracts. In freezing weather, it expands. This movement over time can create cracks in concrete or stone or displace piers and footings. Different types of soil react differently in various climates. Local building codes dictate how deep footings or foundations need be constructed as the requirements account for your specific geographical area. If your porch foundation was built years ago, the depth of your foundation or footings may not have been sufficient for your area. 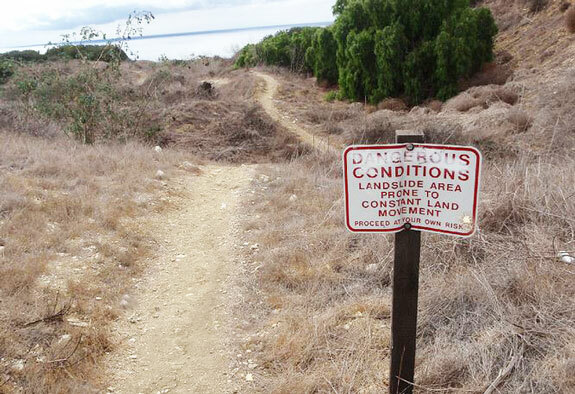 Some geographical areas are prone to shifting soil on a regular basis, e.g., California. There are normally stringent building codes for these areas like the area surrounding Portuguese Point in California where the land is constantly moving. How well you soil compacts is related to natural soil movement. For example, clay will compact better than sand (although clay retains more water and thereby can create other issues). Typically, building contractors work with plumbing professionals to perform hydrostatic pressure tests which in turn determine soil compaction levels. Compressible or incorrect compacted fill soils were used under your foundation, cracks and other issues can occur. Erosion: Erosion can remove soil away from foundation footings causing them to shift. Erosion is easily detected from the surface; however, there are instances when, depending on your soil, erosion occurs below the surface. A friend of ours battled a constant flow of water into his basement whenever it rained. Upon investigations by digging out the foundation, he actually discovered a small underground stream running under his home. Tree Roots: Tree roots can cause damage to foundations as they often do to sewer pipes. Too Much Water: The flow of water across your yard and particularly against your foundation can create significant issues. It is always advisable to ensure water flows away from your foundation. Make sure down spouts are directing water as far away from your home as possible. A word to the wise: a little water over time can create huge problems. Water is not necessarily your friend when it comes to foundations. Too Dry: Intense heat has a direct impact on soil and can especially affect slab foundations. Not all porch foundations are concrete. More often than not, many porches and most decks are post and pier foundations using treated lumber. Although they are not prone to cracking, they can and do sink or fail. Moisture: Excessive moisture can cause your posts, beams, or joists to rot or decay. 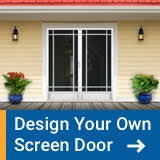 It is extremely important to ensure there is adequate ventilation under your porch or deck. Closing off or even dense foliage can inhibit air flow and create moisture issues. Improper Pier Spacing: If piers were not space correctly, existing beams may not be sufficient to carry the load, thereby causing floor joists to sag or bend under the weight. 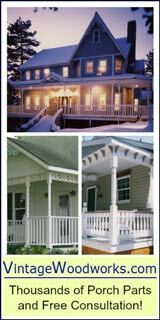 Improper Ledger Board Construction: Perhaps the most common reason for porch or deck failure is improper ledger boards construction. Ledger boards bear a considerable amount of weight and must be attached to the home properly. In addition, ledger boards should be flashed to protect them from water. See our ledger board construction section for more information. Once you've assessed and rectified the reason your porch foundation has cracked or shifted, it is now time to either repair, reinforce, stabilize, or level your foundation. Investigate your porch foundation repair options. 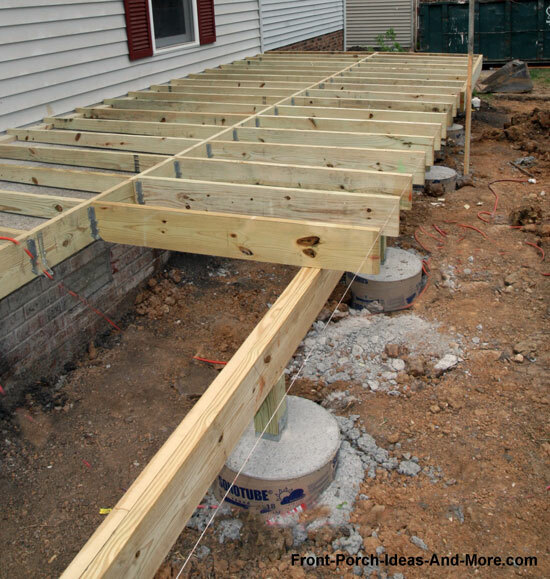 IMPORTANT: Although the process of building or repairing a porch foundation is similar to that of other structural foundations, your porch's foundation will be carrying significant weight and must comply with your local building codes. 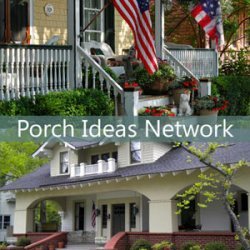 Therefore, it is extremely important to understand what is involved to ensure your porch will be safe and maintain its structural integrity for years to come. 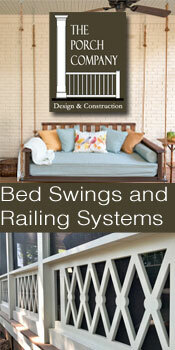 We highly recommend contacting a structural engineer, your local building codes department, or a reputable contractor.